We are engaged in manufacturing and exporting Diode Laser Marking Machine. 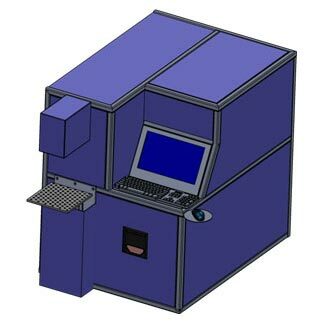 Our hi-tech Diode Laser Marking Machine can efficiently deal with materials like Acrylic, Paper, Plastic, Glass, Leather, Metal, and to name a few. With its professionally designed laser resonator, the quality of beam is made superior. This resonator also expands the processing lines. Maximum speed - cycle time 6 Typical 0.5sec (8 ~ 10 char, 3mm ht)3μm depth. Cooling Water Cooling, Chiller Required. Display 14 Inch LCD Screen. Operating System Windows XP,Windows 7 or Latest Version. Safety Laser Safety Cover Between Operator and Galvo Scanner.